These days we’re all connected to the ‘net at home with PC’s and tablets, and on the go with smartphones, but what about while in the car? The majority of automobiles on the road today just aren’t taking advantage of mobile network Internet connectivity, smart apps and the diagnostic code information that is available via the built in vehicle dumbputers. The proliferation of smartcars is assuredly in our future, but until then, Zubie is rushing to bridge the gap with the Zubie Key product and its associated services. Here’s the abbreviated product rundown from Zubie themselves. The OBD port is usually located under the dash and steering wheel. There is no special or complicated set-up. Zubie is compatible with the majority of vehicles on the road made in 1996 or later. Many of the Zubie features sound appealing and useful. The vehicle maintenance alerts, obtained via computer diagnostic code readings, would be one of the top features that I would be particularly interested in taking advantage of. Zubie makes the claim that over 50% of break-downs are battery related. With Zubie monitoring your vehicle’s computer, which monitors your car battery, you can be alerted to replace the car battery or get it serviced BEFORE there’s a detrimental problem that impacts the vehicle. Living and driving in Arizona for 15 years ensured that I saw my fair share of car battery problems. The blistering Phoenix summer temperatures are known to cut car battery lives short, and most batteries don’t last over the manufacturer’s estimated lifespan or warranty period. If I could get smart notification alerts before my vehicle battery dies, avoiding jump starts and urgent trips to auto-part stores, that feature alone would be worth using a smart OBD device and service. Zubie also offers many more features in addition to the maintenance alerts and notifications. Zubie can track your driving habits, creating a driver profile that contains detailed information on how you drive. 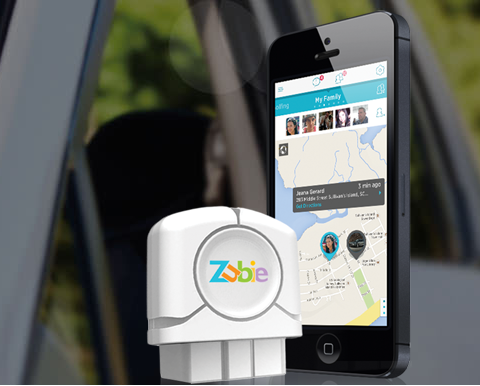 Zubie monitors your driving to produce informative alerts and recommendations. You can leverage these to learn how to improve your driving, save on gas mileage and drive safer. The Zubie service also includes optional gaming elements, offering users the option to earn badges and compete with each other (I’m the safer driver! – No I am, just look at my Zubie stats!). The location awareness features can also keep family members apprised on the whereabouts of one another, with Zubie sending alerts to family members in an automated fashion. This seems very useful for keeping tabs on children or for staying in the know on a spouse’s current location, all without having to send text messages or place a call. Do you know a special someone that might want to transform their car into a smart car? If so, then the Zubie Key and bundled service would make a great gift, for Valentine’s Day or any other occasion. Hit the road with Zubie! The service normally costs $99.95 per year, but you can order today with code SAVE20FEB and SAVE 20% on your Zubie Key plus one year of service. Offer good through March 31, 2014. Shipping charges apply. And Zubie is social too! You can like them on Facebook and follow them on Twitter.